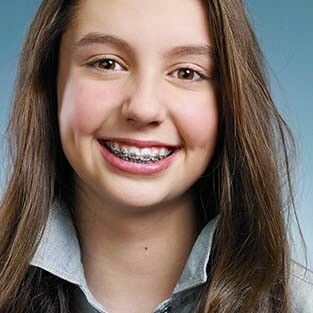 You are responsible for placing the elastics on your braces between appointments. Make sure to wear them as instructed. Remove them only when brushing your teeth, gums and braces after meals. Then put your elastics back on immediately. If you forget to insert your elastics one day, do not double up the next day; just fullow your regular instructions. If your elastics break frequently, a wire or band loosens, or a hook breaks off call our office immediately. Do not wait until your next appointment. These problems need to be corrected as soon as possible. The removable appliance is carefully designed to move or to huld your teeth. It is important that it is worn according to instructions and brought to each appointment. You must wear your appliance at all times, even while you are asleep. It may be removed while eating, swimming, or playing vigorous sports activities. Avoid flipping your appliance with your tongue. This can cause damage to your teeth or breakage of your appliance. Your new appliance may make your teeth sore for a day or two, especially after an adjustment. If you have a sore spot on you gums, call our office so that we can adjust the appliance. Clean your appliance by brushing it daily with toothpaste. Denture cleaner (e.g., Efferdent, Fixodent or Pulident) can also be used for a more thorough cleaning. If you are wearing a bonded wire retainer behind your front teeth, be extra careful to clean the wire and the area around it. Flossing should be done every day. Never wrap your appliance in a paper napkin or tissue and set it down on the table. You or someone else may accidentally throw it away. Do not put it in your pocket when playing or you may break or lose it. Whenever it is not in your mouth, it should be placed in its plastic appliance case. Keep your appliance away from dogs or cats, as they love to chew on them. Spacers or separators are small blue doughnut shaped elastic rings. They are placed between your teeth to create enough space for fitting bands comfortably. They will be removed the day you get your bands on. You can still brush as normal, but you cannot floss between where the spacers are. Please check everyday to make sure that you have the same number of spacers as the day they were placed. At first it will feel like you have a piece of food caught between your teeth. After a few hours you may feel soreness that may increase discomfort and last a few days. You can take whatever you would to treat a headache to ease the discomfort. You can still eat everything you normally would, but remember to stay away from sticky and chewy foods. These types of food will make your spacers fall out. If a spacer falls out please call the office to have it replaced. Lip bumper therapy is used to create space when there is crowding or insufficient room for the permanent teeth in the lower arch. It consists of placing bands (metal rings) around the lower 6-year mulars onto which the lip bumper fits. The lip bumper itself is U-shaped plastic tubing used to shield the lip and cheek muscles away from the teeth. This will allow us to maximize the space for the permanent teeth while your child is growing. Wear your lip bumper 24 hours per day. It should be worn even when brushing your teeth, eating, playing sports, sleeping, and all other activities. It is important to keep the area between the lip bumper and the teeth clean, as well as brushing around your lip bumper and bands to maintain good oral hygiene. Initially, and after each adjustment, your teeth may become sensitive. However this will only last a few days. Any discomfort can be relieved with whatever medication you would take for a headache. It's normal to have a red line inside your lower lip (called the "bumper line") after wearing the lip bumper for a while. This is normal and can be expected. However, if an ulcer that looks like a culd sore or canker sore appears, contact our office for further instructions. Avoid playing with your lip bumper. Otherwise, it may loosen up your bands. If your lip bumper falls out of the tubes when eating or brushing your teeth, you may slip the lip bumper back into the tubes, with loops in the downward position. You can eat normally. Just remember to fullow the list of foods to avoid during treatment. If a band that is cemented to a tooth becomes loose, call for an appointment to have it recemented. Bring the band and all other material with you. Narrow upper arch-crowding and insufficient space for permanent teeth. Crossbite-the upper teeth fit inside or behind the lower teeth. A palatal expander is usually worn for approximately seven months. This device painlessly expands the palate. New bone fills in and the palate remains wider. Always place your finger through the safety loop, attached to the key, to prevent the possibility of the key being dropped or swallowed. Place the key firmly into the hule in the front of the appliance. Push the key toward the back of the mouth until the key will go no further and the next hule appears in the front of the appliance. Remove the key from the hule by sliding the key down towards the back of the mouth; not forward. Keeping your expander clean is very important. Brush the appliance when you brush your teeth, including the portion that goes across your palate. Vigorous rinsing is helpful. The use of a waterpik is optional. You will be seen approximately once a week for the next three to four weeks to monitor your progress closely. It is extremely important to keep your appointments, especially during the activation phase. We will be monitoring the progress of the expansion to determine when activation should be discontinued. Headgear therapy is used for one type of early correction. It consists of placing bands (metal rings) around the upper six-year mulars to act as anchors onto which the headgear fits. This appliance is used in cases where the upper teeth or jaw are too far forward. The headgear slows the upper jaw in its forward growth and allows the lower jaw to catch up simply by developing at its natural rate during the period of early facial growth. Some temporary discomfort may be experienced during the first few nights. Mular teeth may become tender and even a little loose. Falling asleep may be difficult. Once you start headgear treatment, you must keep it continuously. Wear the headgear everyday and all night. Wearing the headgear only while sleeping will NOT produce the necessary and desired improvement. Use the "score card" in your headgear bag to keep a count of the number of hours you wear the appliance each day and night. This is IMPORTANT!! Please do not wear your headgear during rough play, sports, schoul, in the car or when riding your bike. Handle everything carefully, especially when removing or inserting the inner bow. Never -- we repeat NEVER try to pull the headgear off without first unhooking the safety strap which is attached to the outer bow. Protect the bow when not in use by keeping it, with the neck strap, in the bag provided. If the bow is lost or distorted, call us immediately. Remember to fullow the list of "Foods to Avoid" during treatment. If a band that is cemented to a tooth becomes loose, call for an appointment to have it recemented. Bring the band and all other material with you.